The ease of deployment, business model, and efficiencies offered by SaaS have transformed how companies of all sizes do business. As a result, for more than a decade SaaS has attracted billions in venture funding and inspired thousands of entrepreneurs to launch new products. But only in recent years have we seen an explosion in adoption broadly in small and medium-sized businesses (SMBs), across a variety of industries and a spectrum of departments. 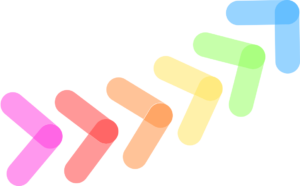 Blissfully helps hundreds of companies effortlessly manage their SaaS vendors, across thousands of subscriptions and millions of monthly spend. This gives us a unique position to evaluate SaaS trends, especially for small and medium businesses. While various studies have explored SaaS usage across large enterprises, there is little data on SMBs. Our companies have on average just under 100 employees. Furthermore, we aggregate real world SaaS spending and usage data (not just surveys), going back eight years, providing some great insights into the evolution of SaaS. As we dug into the data, a few trends emerged. 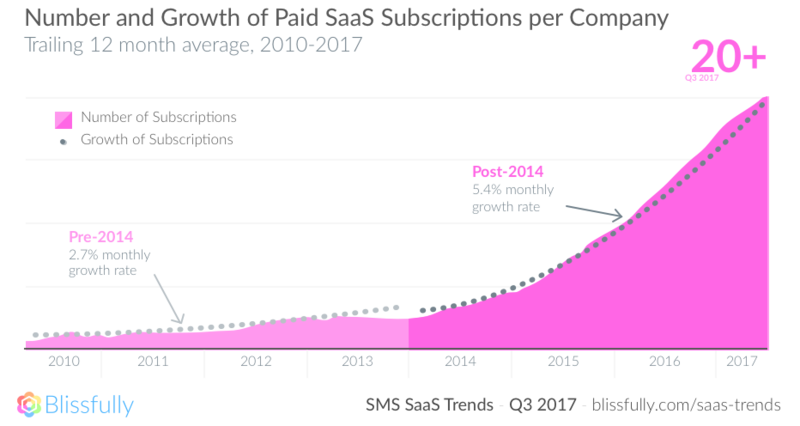 SaaS usage is truly accelerating across businesses in general, with the adoption of paid SaaS subscriptions rising over 4x in the last 20 years to more than 20 products for an average SMB. SaaS has taken root across all functions and departments, as non-engineering SaaS spend rose from about 10% in 2010 to over 80% today. The number of SaaS offerings and vendors have exploded along with this rise in adoption and spread throughout the organization. These trends have big implications for everyone in the SaaS ecosystem, from investors to builders to consumers. 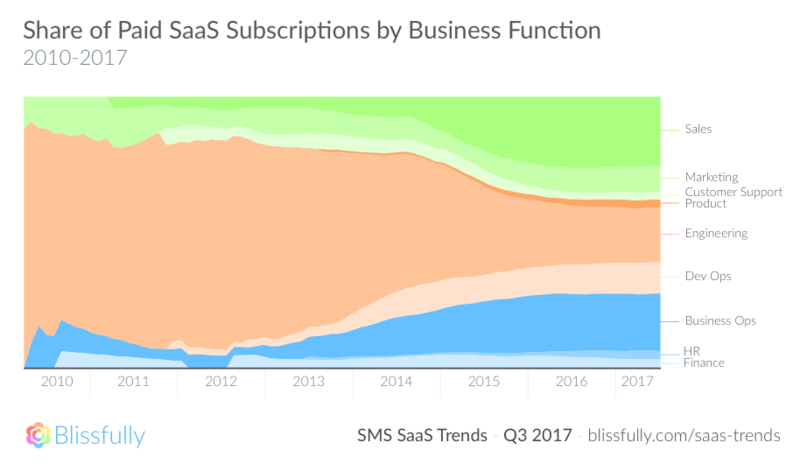 Receive a free PDF eBook of the entire 2017 Q3 SaaS Trends Report. Today, the average SMB uses 20 paid SaaS products across their organization. This number has increased dramatically in the last two years, quadrupling since 2015. The rate of adoption of SaaS products by the SMB doubled after 2014. From 2010 to 2014, the average SMB averaged a 2.7% monthly growth rate in the number of SaaS products adopted across the organization. This monthly growth rate increased substantially to 5.4% after 2014. In just two years time, the average SMB has quadrupled its spending on SaaS products across the organization. Today, the average SMB spends just over $15,500 every month on SaaS products. Annualized, this equates to over $186,000 per SMB. Dramatic increases in spending began in 2014, increased substantially every quarter through 2016, and continues to rise today. SaaS is used across the entire organization. SaaS products are being utilized by nearly every business function across the organization. In 2010, paid SaaS products leveraged by engineering dominated 90% of the average SMBs usage, down to just 20% today. Sales and Business Ops each now account for approximately 20%. 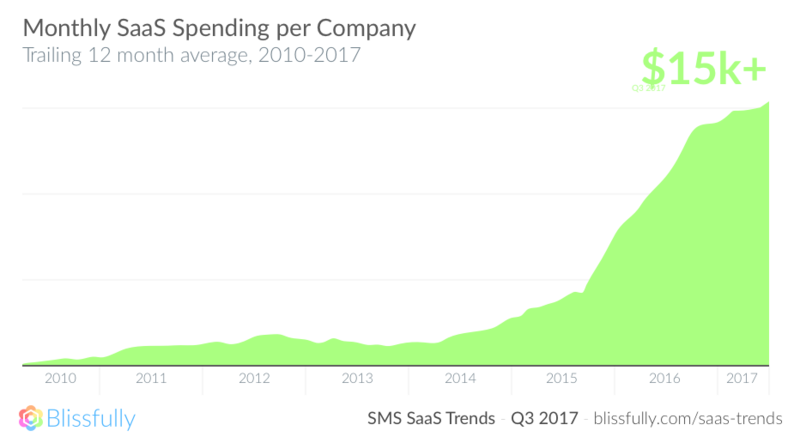 Marketing and Dev Ops are each about 10% of spending, with Marketing holding steady since 2010, and Dev Ops rising from zero spending in 2012. Finally, HR, Finance, Product, and Customer Support have all come from nearly zero spending five years ago to account for about 3% each. SaaS is also managed across the entire organization. As SaaS proliferates across all business functions, it also means that the management and ownership of these subscriptions are increasingly distributed. Our data shows that 1 in 7 employees is managing (e.g. being the billing owner) for a SaaS subscription for their organization. Pushing SaaS ownership and management throughout the organization is empowering and can lead to better products and decisions. However, this can also lead to SaaS chaos, creating potential security risks and financial waste. In fact, this trend of SaaS ownership moving outside of IT’s control is a big reason why we started Blissfully. SaaS is not just built in Silicon Valley. 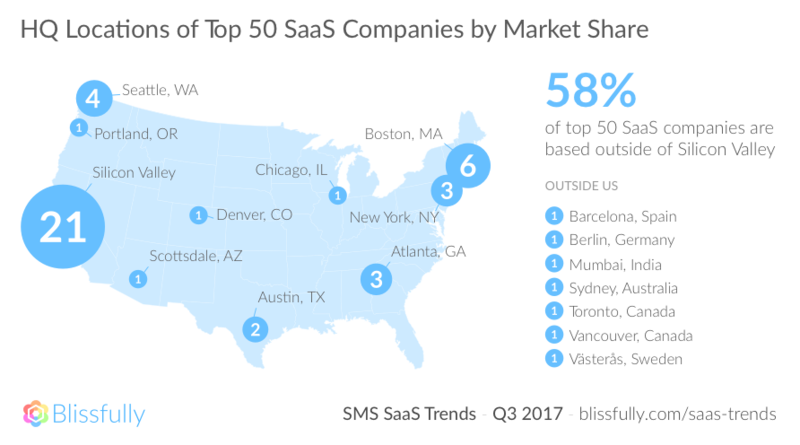 While Silicon Valley is known as the hub of venture capital investment, the majority of top paid SaaS products leveraged by the SMB are headquartered outside of Silicon Valley. Top products by market share show a wide variety of product function. The top products by market share show a huge variety of business functions, further supporting the point above that SaaS has really permeated all business functions. In the top 25, we see a lot of the usual well-established players: G Suite, Github, AWS, Slack, Salesforce, Hubspot, Office365. We also saw a lot of companies focused on the marketing stack, MailChimp, Moz, Unbounce, complemented by data enrichment and syncing pair Segment + Clearbit. You’ll also notice a lot of the companies we highlighted in our recommended appearing here in the top 25 (and top 50 in the full report), including G Suite, Github, Zapier, eShares, Gusto, and Zoom. This shouldn’t be a surprise, that’s part of the reason we recommended them! 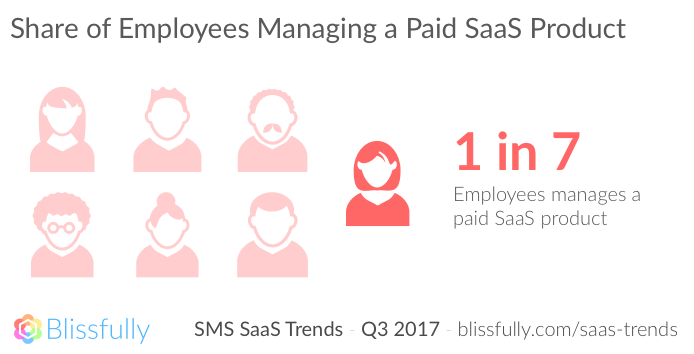 The data in this report underscores the recent SaaS explosion in SMBs, on both spend and usage fronts. This impacts everyone in the SaaS ecosystem: builders, investors, and consumers. Here are some key takeaways for each group. If you’re building and selling SaaS products, the upwards trends in this report set the stage for continued disruption and opportunity. However, this also means the competition will be fierce as more and more products are available to the SMB across numerous industries and functions. The opportunity in SaaS is strong as niche products disrupt otherwise one-size-fits-all offerings, new business models ease SMB adoption, and new products cater to more functions across the SMB. Regardless, the competition for new entrants will be tough, making speed and quality of execution critical to success. SaaS products will continue to proliferate and offer a range of meaningful value propositions across your organization. Expect continued increases in usage and spending, and more SaaS options and vendor choices than ever before. While SaaS offers many benefits for your business, it is also overwhelming to evaluate and manage ever-increasing options from a cost efficiency, security, training, and IT management perspective. SaaS management is more critical than ever. Luckily that’s why Blissfully exists, to help simplify SaaS management. If you’re interested in seeing more, you can download our full report at blissfully.com/saas-trends, and if you want to get a free, instant SaaS audit and see how your company stacks up, sign up for Blissfully.